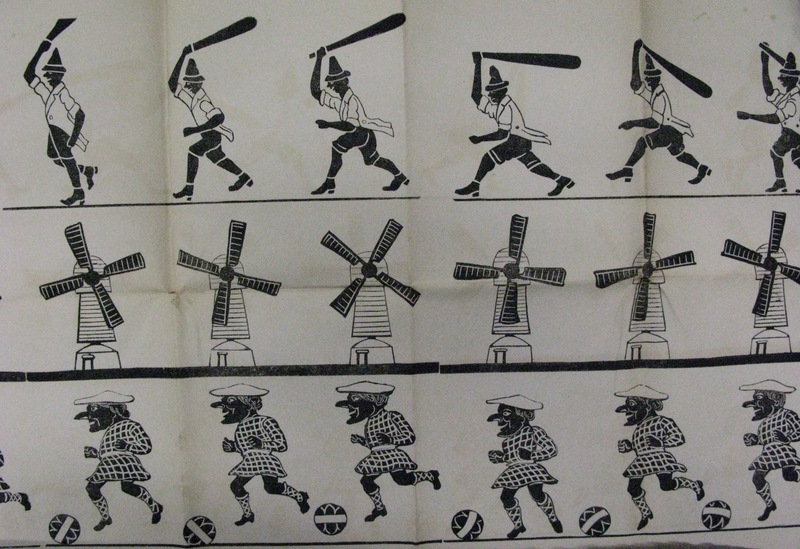 ﻿Recently while cataloguing chapbooks I came across a series of large, folded sheets with strange sequences of images on them and became intrigued to see what they were. It turned out they were templates for a zoetrope, a type of Victorian optical toy. The zoetrope was used to create the illusion of motion. By viewing a series of images or frames on the inside of a spinning drum, through slits on the outer side, a form of animation was created. It was invented in 1834 by William George Horber, originally dubbed the “Daedalum” or Wheel of the devil; however it didn’t really become popular until 1867 when it was patented in the UK and USA and was renamed the Zoetrope (or Wheel of life). The zoetrope’s popularity though, was fairly short lived. 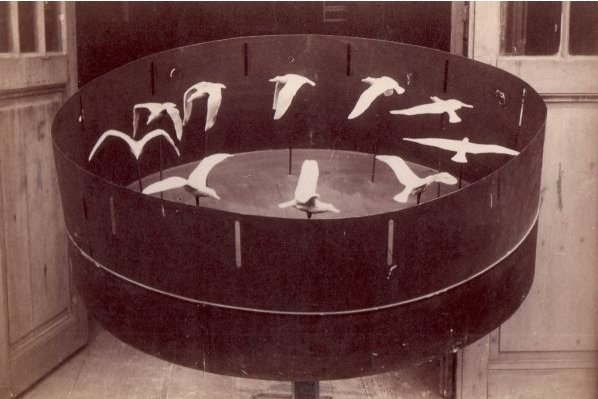 It was one of many Victorian optical toys, such as the thaumatrope and phenakistoscope (a 2D spinning disk of images and slots which were held up to a mirror) and was soon replaced by the sharper view praxinoscope in 1877, which used mirrors within its drum. These developments in making still images appear mobile were soon followed by magic lanterns, flexible photographic film and the emergence of modern cinema in 1895. 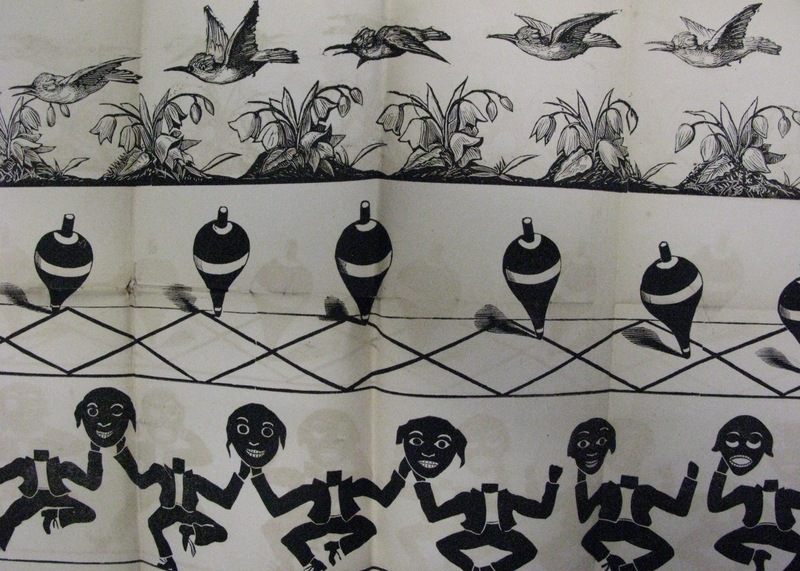 In the 21st century new linear zoetrope designs emerged and were used to create novelty advertising campaigns in underground systems across the US, Asia and Europe. While many zoetrope pictures were colourful, detailed, pretty and entertaining, the ones I had unearthed were dark, weird and a little unnerving. My Clarke’s wheel of life series offered delights such as ‘blowing bladders’, ‘Monkey and dog’, ‘Man swallowing rats’ and the unexplained ‘head off!’. Luckily we haven’t yet found those ones so instead I include some of the less disturbing (ish). To see them in action youtube has a couple of offerings, as does the George Eastman House, International Museum of Photography and Film. Or for the more practically minded, you can design and build your own. Clarke suggests colouring in outlines consistently with bright red and green .. . so a most marvellous illusion is produced! though perhaps you may go for one a little less creepy.